With its flashy salmon hue and silky texture, lox usually gets the most bagel pairing attention. 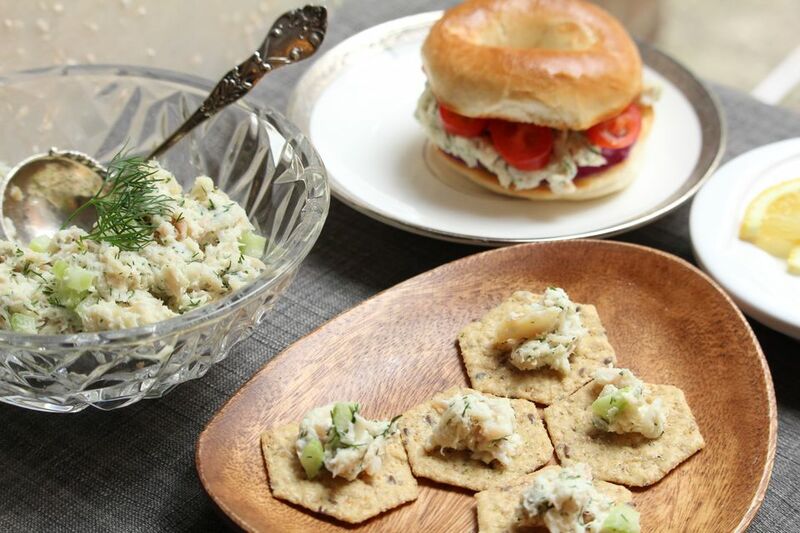 But if you haven't tried whitefish salad, you're missing out on a worthy topper not just for bagels, but for everything from challah or crackers to crudités. Its humble look belies a rich, smoky flavor, punctuated by the crunch of celery and the bright flavors of fresh dill and a hint of lemon. It's quick and easy to make, too -- perfect for when you want a simple yet sophisticated upgrade from tuna salad. Where to Find Smoked Whitefish: Bagel shops and Jewish delis often carry whitefish, as do some supermarkets, fishmongers, and warehouse clubs, like Costco or BJs. Brooklyn-based Acme Smoked Fish has a helpful store locator on its website, which can help you track down its kosher-certified whitefish. Remove the skin from the whitefish (it will lift off easily). Use clean fingers or a fork to pull the fish off of the bones. Transfer the fish to a medium-sized bowl. Use a fork to break the whitefish into smaller pieces, removing any small bones you find. Add 1/3 cup mayonnaise, the celery, dill, and lemon juice and mix well. Taste and adjust the seasonings if desired, adding more mayonnaise if you prefer a creamier texture or milder flavor. Try fresh chives or parsley in place of the dill, or opt for a mix of all three. For a little bite, add finely minced red onion. For a smoother, more spreadable salad, omit the celery, and increase the mayonnaise. Mix very well to break down the fish into smaller pieces. For more lemon flavor, add a bit of finely grated zest along with the lemon juice. For dairy meals, try replacing half or all of the mayonnaise with sour cream. As a meal: Whether for fancy brunches or casual weekday meals, whitefish salad is a natural fit: serve it on bagels with lettuce, tomato, and red onion, alongside omelets, or roll it into a wrap with cucumber, tomato, carrot, and/or bell pepper. As an appetizer or hors d'oeuvres: Whitefish salad makes great party fare. Offer it on crackers, toast points, or blini, or alongside a platter of crudités. Or spoon it on cucumber or radish slices, or into halved cherry tomatoes. As a plated appetizer, try it with a salad of fanned avocado slices and supremed grapefruit or orange sections. If you make it with kosher-for-Passover mayonnaise, this whitefish salad makes a great option for brunch or lunch during the holiday. Serve it on matzo or Passover rolls. Or for totally gluten-free options, wrap it in lettuce leaves, or roll it up into thin strips of cucumber (use a mandoline or vegetable peeler to make lengthwise slices), à la sushi rolls.